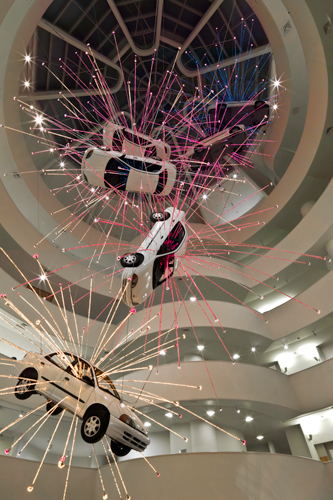 Now on exhibition at the Guggenheim, NY is a retrospective of the work of multidisciplinary Chinese artist Cai Guo-Qiang. Cai (b. 1957, Shanghai) works in a variety of media from installation pieces using found and manufactured materials, site specific works displayed via video such as his “explosion events”, as well as paintings and drawings made with gunpowder. The piece pictured here hangs in the rotunda of the museum and is called Inopportune: Stage I and is a visual re-creation of a car bombing inspired by car bombings around the world post 9/11. The nine suspended cars build from the ground level where the car is lit with white/ yellow light and each successive car, suspended higher in the air at varying angles, erupts with colors turning brighter as they ascend into shades of purple, pink and blue. Cai’s fascination with explosives appears throughout the exhibition as he painted with gunpowder on canvas early in his career and then later created gunpowder drawings on what appear to be Chinese folding screens. He later evokes the traditional Chinese visual language of inky drawings on simple cream paper but in an explosive new media. Juxtaposed with his gunpowder drawings and paintings are videos of “explosion events” where, for example, the artist attempted to extend the Great Wall by continuing a snaking line of explosion from one end of the Great Wall to mimic the form of the wall running through the landscape or he responded to the Madrid bombings by creating a fireworks display in broad daylight in Valencia Spain using only black fireworks to replicate the Spanish train station explosions. The body of work creates both a visual language of line and form and a theoretical, conceptual response to explosions and world events. The exhibition, entitled I Want To Believe, runs through May 28th.